Ever high minded, The New Republic has seen reason to explain to us why the Occupy movement is hysterical and dangerous. Worse yet, trotting out an Cold War trope, TNR thinks the General Assembly political form “has an air of group-think about it that is, or should be, troubling to liberals.” Group-think so very unlike, of course, corporate boardrooms, trading floors, and, dare we say it, editorial boards. (We struggle to remember the last war TNR failed, so predictably, to support.) Luckily, we have that venerable mouthpiece of radical criticism, Business Insider, to remind us of some of the reasons why one might be on the street these days. Its summary of the economic situation is excellent, and very helpfully arranged with illuminating graphics. For our part, we think the Occupy movement, like most protest movements, is mixed, and still in formation. Having spent the weekend at Occupy Boston, and yesterday facilitating an open air class at the camp, perhaps the most noticeable and exciting feature of the movement is the desire and willingness to think everything anew. The freeing of the imagination may, in fact, be the first and most significant effect of these protests. And just about everybody there seems to be open to debating all kinds of new ideas. But it’s not just the Paulites who want to abolish the economic fictions that seem out of control. One also sees a lot of signs against corporations. ‘Corporations are not persons,’ is a familiar one. In so far as these signs are protestations against the Citizens United ruling, which used the fact that corporations are ‘legal persons’ to argue that they have free speech rights, we agree with these signs. But these signs often express a kind of parallel antagonism to the Paulite rejection of fiat money – abolish the fiction, return us to the real thing. Real persons, actual gold. That is, in its roughest outlines, the ‘destroy’ side, or at least ‘refuse’. But the problem is that in large, global economy, based on the division of labor, there is no way out of such abstract or seemingly ‘fictitious’ relationships. And in fact, there are some very good things about them, on the basis of which one could start thinking about alternatives. In the case of corporations, we can think of at least three aspects of its legal or ‘fictitious’ personality that are a good thing. For one, abstracting for the moment from the specific rules of ownership and control, a corporation is a large amount of cooperative workers who work towards a common end. It is a collective economic agent. As such, it can take advantage of economies of scale, and these economies are potentially enormous (think of electricity, or steel, or even health insurance. Those actuarial risks are much more reliably calculated over a massive population than a small one.) There is no reason, in principle, why these economies of scale cannot benefit everyone. One can imagine large scale production dramatically reducing the amount of hours any given person must spend doing necessary work. That’s not our society – in which one in six have too little or no work, while many of the rest have to work too long. But it could be our society – and an important feature of that society would be using the productivity of large scale enterprises to meet human needs with minimal effort. 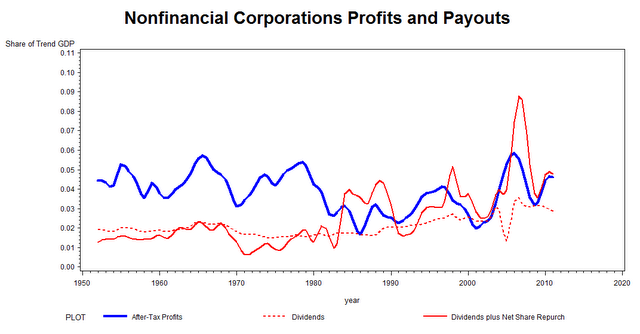 These dividend payouts, and shareholders cashing in, came from reorienting activities to the short-term share values, and by keeping wages low – hardly an arrangement that has served the public interest. (Especially since households compensated for stagnating wages by borrowing, and we know how that has gone.) But there is nothing necessary about this particular relationship between owners and controlers. In fact, the separation of ownership and control at least used to be considered, by the Left, as one of the good things about corporations. It suggested that, against reigning ideology, the rentiers (shareholders) didn’t do much, since it was managers that ran day-to-day operations. Why, then, not euthanize the shareholders, have workers hire managers, and democratize the firm? And more broadly, the point is that the relevant stakeholders in a corporation – whose very existence is recognized, in American law, as necessary only to serve a public interest – are not just shareholders but also its workers, and the general public. As an artifact of law, the structure of ownership and control could be changed so that the idea – creating this collective agents for the public good – could better fit reality. (The best summary we’ve read on these questions is still the ‘Governance’ chapter of Doug Henwood’s Wall Street, available for free download.) Again, this democratization of the corporation hinges on seeing its artificiality or ‘fictitiousness’ as a good thing – as a feature of it being a creature of law, which we can change and control. Finally, our one other thought is that corporations are said to take risks, and to engage in risky behavior that endanger the wider community. And part of the reason why it does that is because of its fictitious personality, the fact that its managers and shareholders only bear limited risks, that corporations can ignore all kinds of negative externalities, and this leads to bad outcomes. This may be true, but it is not an inherent feature of collective economic agents. It’s a matter of how we have constructed laws and incentives, such that we often socialize the risks but privatize the benefits of corporate activity. But there is nothing in itself wrong with giving certain collective agents the power, within appropriate constraints, to take risks. Taking risks, making a bet on the future, is a necessary feature of large scale economic activity and progress. It would be nearly impossible for an economy to do things like develop new planes, which take decades to develop, test, and manufacture, or new energy technologies, if it did not allow groups to take a bet on the future, to take risks with some portion of our economic surplus. How we arrange which risks are taken, and who bears the relevant risks, as well as who benefits from the distributions is again a matter of law. But it is not the risk-taking itself that is the bad thing about corporations. These are not final positions, but initial thoughts, produced in response to the emerging economic thinking of the new Occupy movements, and with the hope that the initial, quite justifiable, feeling of rejection of fictions might be transformed into a more positive and constructive attitude, that finds a vision of the future in the seedbed of the present. The other alternatives we have heard discussed, especially ones that try to eliminate all of our seemingly fictitious or unreal economic practices, seem to us to be more of a rejection of the division of labor and large scale production itself. It’s hard to find a positive vision in that.